An Icebreaker that's Reflective and Fun! 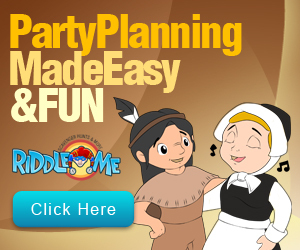 This Right Left Thanksgiving Game will add a dash of fun to your family Thanksgiving celebration. Use it to give small prizes to family members, to decide who will get the turkey drumsticks, or even to choose names for your annual Christmas gift exchanges. For instructions or prize ideas, see our Right Left Christmas Game or our Right Left Easter Game. Cory looked LEFT and then RIGHT, and then RIGHT again, before running across the street. A package was tucked under his RIGHT arm. He started RIGHT down the sidewalk and finally turned LEFT onto the pathway that led RIGHT to his house. He shoved the door open with his RIGHT shoulder and dropped the package RIGHT on the floor. His mother called to him from the room to his LEFT. “Cory, you need to help me clean the living room RIGHT now,” his mother explained. “We have guests coming for thanksgiving,” his mother explained. “Who?” Cory questioned, placing his baseball cap on the hook to the LEFT of his dad's and the RIGHT of his mom's. “Mr. and Mrs. Weathers,” his mother answered, placing her RIGHT hand in an oven mitt. “They’re practically homeless, RIGHT?” Cory questioned, grabbing his backpack and throwing it over his LEFT shoulder. “I don't see how it is the RIGHT thing to do. This is our house. They should have dinner somewhere else,” Cory grumbled out of the LEFT side of his mouth. “Cory,” his mother reprimanded, trying to juggle a pot between her LEFT and RIGHThand. 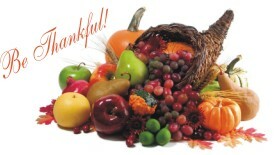 “We have so much to be thankful for. It's only RIGHT that we help someone else.” “You may be RIGHT, but I want to have a friend over,” Cory complained. “Once they have LEFT, you may have your friend over, as long as you are polite to the Weathers,” his mother added, smiling gently. “Cory, you have a warm house, RIGHT?” his mother asked, picking some toys that had been LEFT on the floor. “Well, the Weather's don't have all the nice things that we enjoy. With the small amount they get paid, there isn’t much LEFT over after food, clothes, and all the necessities. “Yeah, I guess that would be the RIGHT thing to do,” Cory agreed. “Good, I'm proud of you Cory,” his mother said, reaching over and giving his RIGHTshoulder a little squeeze. “On the bright side, there will be plenty of LEFTovers,” Cory stated, smiling. Later that evening, the Weather's came over. Cory remembered to be very thoughtful. He even gave the Weathers kids some of his old toys that were LEFT over from the garage sale he had held to raise money for his new baseball glove. The kids beamed happily, and Cory was glad that he had done the RIGHT thing. 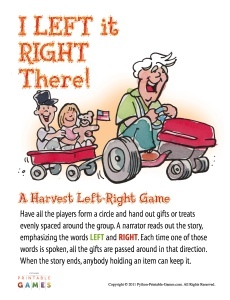 Would you like a printable version of this Right Left Thanksgiving Game? Fill in the form below and you will have immediate access to a printable copy of this Right Left Thanksgiving Game. 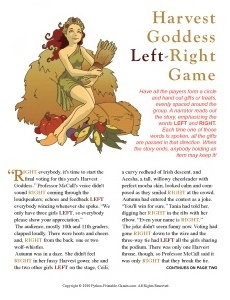 To view this printable Right Left Thanksgiving Game, you will need Adobe Reader installed on your computer (the latest version is recommended). You can get your free Adobe Reader here (a new window will open so you can download without leaving this page).